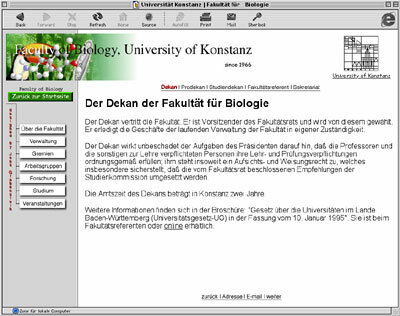 The first commercial product of my work as a web designer has been the redesign of the homepage of the Department of Biology at the University of Konstanz when I was a first year student there. 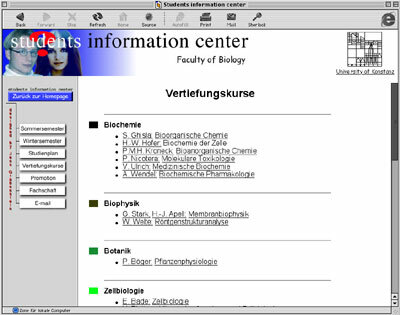 The current homepage is based on my basic design, however, it is no longer as consistent with the original design as it was in the beginning. The web site actually consists of three homepages. The concept behind this is the idea to make the use of the web site as easy as possible. The general part and the starting pages deal with structure of the department and the positions within it. The two other homepages are dedicated to the concerns of students and the research conducted by each faculty member sorted by general research topics , respectively. 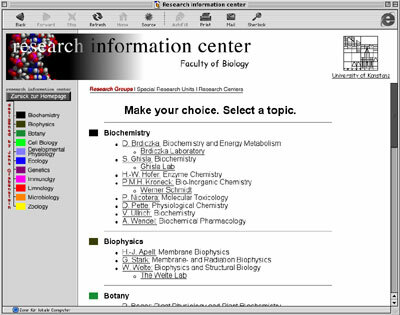 Those two distinct parts named "research information center" and "student information center" also feature a distinct design different from the main homepage. The different fields of research like biochemistry, biophysics etc. are color-coded to help the user to navigate with the site. The web site is based on frames. The idea behind that was that it makes it easier to maintain a consitant look throughout the site because navigation elements are constant. If a page needs to be updated this can happen without changing any of those constant elements.